Today, all over the country, is Free Comic Book Day - an event where participating comics shops give away free comics and have special events. Here's how it works at Atomic Books. 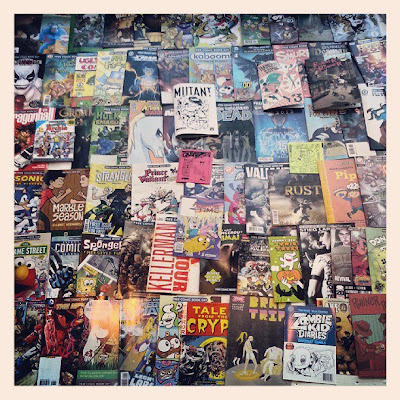 We'll be giving away free copies of our own annual free comics anthology, Mutant #4. We'll also be giving away free copies of Haliegh Buck's Internet Diarrhea. These two books are exclusive to Atomic Books. We'll also be giving way copies of Runner Runner, Handout Comics #3 and Master P's Theater (if it arrives in the mail in time). These you most likely won't be able to find at comics shops anywhere else in the area. We'll also have copies of all the regular Free Comic Book Day releases. And you can get 1 each of every title. On top of that, all of our graphic novels and art books are on sale 20% off and all bagged and boarded back issues are on sale for 50% off.